VOX+ VR headset 2017 updated version, integrate visual and audition, provide shocking 3D sound when you enjoy IMAX 3D movies. Just need to download an APP which can provide 3D video into the VOX+ VR, put it in your smartphone. It will stimulate a private cinema for you anytime and anywhere. Not only can you realize the scenes of Mars, the Imperial Palace, Beach…but also can experience roller coaster, Real CS and other exciting game by VOX+ VR. 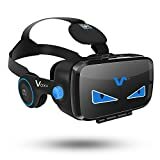 The VOX+ VR headset with a [OK] button, you can control the screen to realize confirm, next page and other functions without using Bluetooth devices. So you won’t need to remove the phone to achieve pause/ play function when you immersed in the 3D vr world, or can answer the call by single press directly. With a built-in retractable headphone, suitable for different head size, made of high quality memory sponge and protein skin which are more comfortable and stronger sound-proofing to reduce the noise outside your vr world. Ultrahigh quality sound will bring more shocking audio-visual experience to you. The total Immersion 120°large visual is more near to human’s visual angle while general product is less than 100°.Cater for the needs of 0°- 800°myopia and 0°- 400°hyperopia, no need to wear glasses and easy to adjust the focal distance after wearing the VOX+ VR headset. The air will float through the 6 pores, which can assure the heat spread out from the top as soon as possible. Compatible with 4.0″-6.2″smartphones,like iPhone 5s/SE/6/6s/7/7 plus; Samsung S5/S6/Note 4/Note 5/S6 edge; LG G3/G4/G5/V10;Nexus 5/6P and so on. Recommended to use a Bluetooth vr controller（Sold separately）when you experience the vr game. We provide a 30-Day money back guarantee and lifelong technical support. It is unlike anything you’ve ever experienced.Whether you’re stepping into your favorite game,watching an immersive VR movie,jumping to a destination on the other side of the world,or just spending time with friends in VR,you’ll feel like you’re really there. VOX+ FE VR features an integrated VR audio system specifically designed to make you feel as though you’re truly somewhere else – giving you a sense of space and depth. The headset arms are retractable so so you can adjust to the position that best suits you. Why choose VOX+ BE Virtual Reality Headset? VR Bike,A virtual reality game for google cardboard…. please feel free to contact us to get the download link. For any problem of VOX+ FE Virtual Reality Headset, please feel free to contact us directly. We provide 30-Day Money Back Guarantee and life time service.